Just the nightmare every wife is afraid of, your husband tells you he’s going to start a neighborhood watch group but you find out he’s really using it to slack off. He’s not the hero you thought you married. At least, he isn’t when the movie Neighborhood Watch opens. 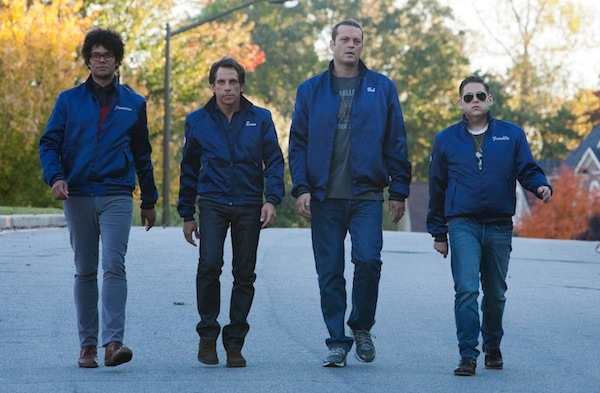 A group of family men, played by Vince Vaughn, Ben Stiller, Jonah Hill and Richard Ayoade, are tired of hanging out with their families (never heard that one before). So, they decide they should start a “neighborhood watch” club to “keep an eye” on any wrong-doings that might happen in their suburban wasteland. Of course, this is just a clever front for these four men to escape family duties and do whatever they want. This plan only has one way to end up. Backfiring! So, as you know from watching countless Vince Vaughn and Ben Stiller movies (Dodgeball was a gem, remember that? ), there is going to be a tough situation which our guys have to get out of. And that’s just when things get interesting. If you say you’re gonna protect the neighborhood, you better protect the neighborhood. When the group discovers a plot to destroy the earth (yes, I said earth not just the neighborhood), they quickly realize if they don’t switch gears into protecting fast, their families might really be in danger. Aliens and angry wives abound. We’re wondering which is actually worse? Well… you’ll have to see the movie to find out, because from the looks of this new trailer, there isn’t much more than suburban dad attitude to show audiences what they might be in for this summer from Neighborhood Watch. The action-sci-fi-comedy co-stars Billy Crudup (Almost Famous, Big Fish), Rosemarie DeWitt (Cinderella Man, The United States of Tara) and Will Forte (Saturday Night Live, MacGruber). It was written by Seth Rogen and Evan Goldberg (Pineapple Express, Superbad, The Green Hornet) as well as Jared Stern. The film releases in theaters July 27.